Let work flow for even the most complex processes. Standardize your business processes and increase visibility at every step of your document or contract processes. SpringCM workflow automation can scale to fit your specific needs. 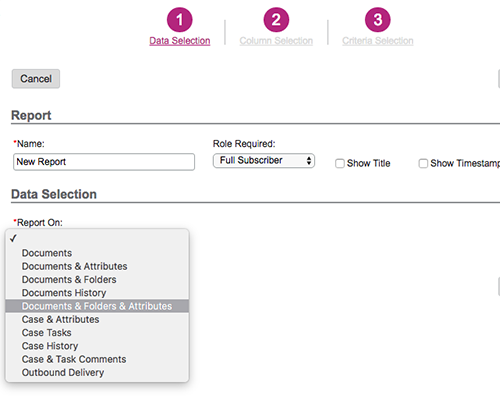 For example, our Smart Rules feature automates routine tasks by setting up convenient “if / then” processes. With an automated workflow, you can get back to what you do best! Design and update your workflows from any browser without additional software. 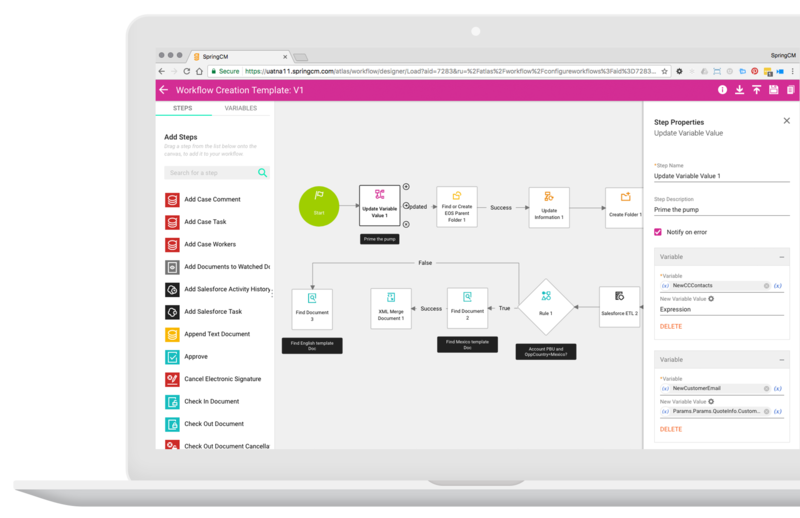 SpringCM Workflow Designer provides a modern user experience to set up workflows for actions taken on a file, folder, or even from external systems like Salesforce. 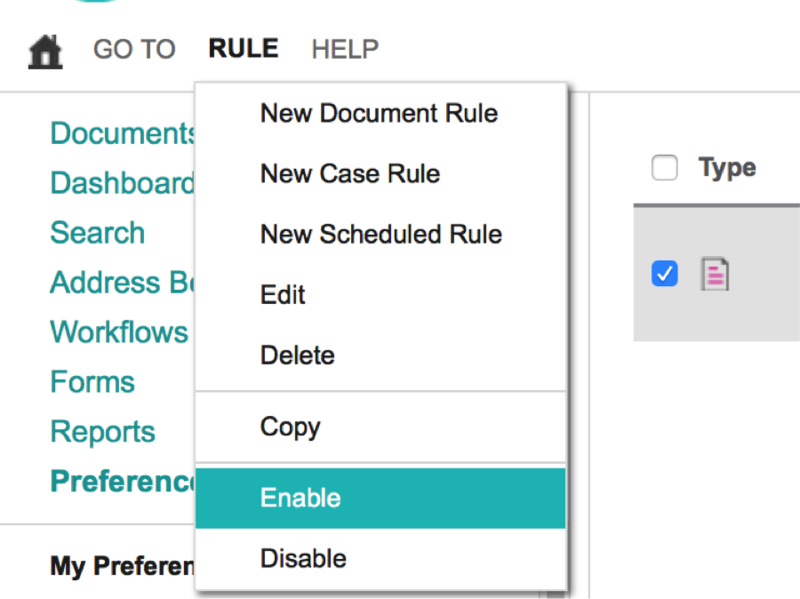 Automate administrative tasks, kickoff advanced workflows, or tag documents and reports — Smart Rules allow you to do significant process automation with little or no coding. For example, you can create rules to automatically route an individual document or a group of related documents to a specific folder. Or define searchable, custom tags that sync with Customer Relationship Management (CRM) systems, like Salesforce, and automatically link to certain documents to aid in tracking and reporting. Automatically route contracts or documents to people inside or outside of your team. 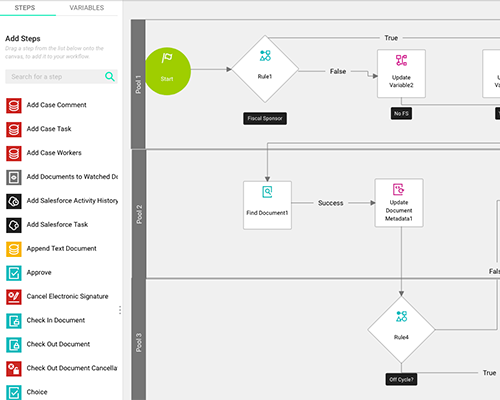 Advanced workflows are especially useful during contract or document generation, when you can use predefined data to reduce human error, automate distribution for approval, and archive approved versions with minimal user interaction. Quickly track down a document by searching for metadata such as contract start date or customer name. You can define how to tag documents according to their specific business needs. 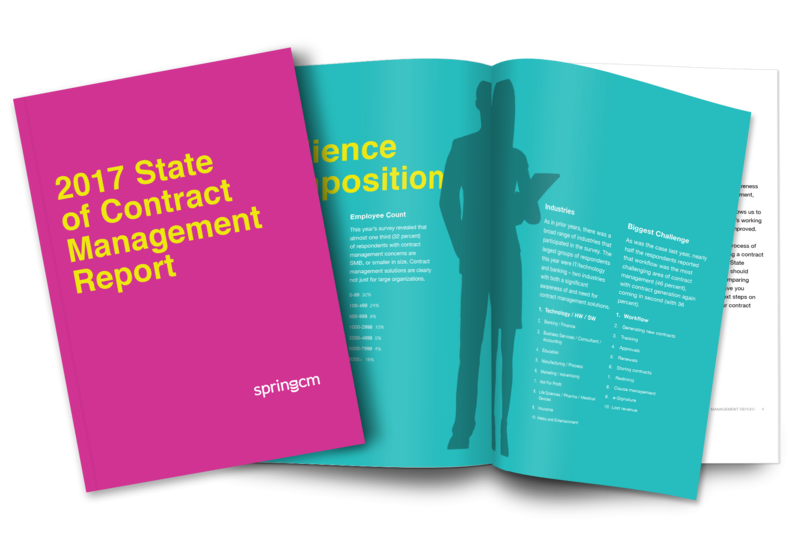 These tags can sync with CRMs, like Salesforce, to keep sales teams working with the same customer data and they can be leveraged to track contracts containing non-standard or negotiated clauses.